During my employment at the Honolulu Symphony, there was a Jewish violinist who was a survivor of the Holocaust. His name is Ignace Speiser. He acted a little bit strange and most of the members of the symphony did not want talk to him. However, I was able to befriend him. I then decided to compose a piece for him. That piece was the Philippine Serenade for Violin and Piano, which he edited and subsequently premiered. This piece is an example of a kumintang which is originally a war song from Batangas that later softened into a love song. It is one of several pieces dedicated to my wife, Josefina. Dungawin Mo Sinta (Look out the Window, My Love) This piece is one of my earliest compositions having written it in 1942 when we were serenading young ladies. For the purpose of Angelito Agcaoili’s recording project, I arranged it for solo guitar. It begins with a typical “pasakalye” or introduction. This is the exact intro commonly used when we were serenading in the 1940’s. I remember it very well since I was the one playing the guitar. Therefore, I would like to dedicate this composition to the “Haranistas” or Serenaders. Kapilas Na Giting was premiered by Filipino guitarist Agnes Narciso as an international master class exhibition piece at the Espla Conservatory of Music in Alicante, Spain in 1976. It was written in the contemporary mode using traditional classical guitar techniques. The heart of this piece is the percussive beat of the pounding song of the Ifugaos, a northern Philippine tribe, paired with the lyrical kumintang, an ancient Philippine war chant that evolved into a love ditty. The composition showcases the tonal and rhythmic agility of the guitar. Kundimang Walang Titik was written with a twofold aim: to create a piece that is hewn very closely to the traditional character of the kundiman – considered the national song form of the Filipino people- and at the same time endowed with a fresh vitality by occasional contemporary touch. As such, certain elements of the kundiman, such as the minor-major relationship of the first and last section (with an intervening key chance in the second section), the general stress on the second beat of measure, the Neapolitan flavor and the essential poignancy and sweetness germane to the Filipino spirit, can be found n the music. Contemporary manifestations are evidence, on the other hand, through unusual modulatory key shifts and subtle rhythmic permutations. A descending six-note figure that dominates the first and second section provides a sharp contrast to the ascending motif in the third section that marks the outpouring of emotional ecstasy earlier wrapped in cloud pathos. This work was commissioned by the Phoenix Phil-Am Club and Mr. Angelito Agaoili. Kudyawit is a coinage of two Filpino words – kudyapi, a native Philippine lute, and awit, which means song. The song signified in this guitar piece, however, relates more to the essential energy and vibrance of the kudyapi than to any melodic articulation. The faster rhythmic mode called binalig – what homegrown kudyapi players call the modern style – which is an incessant barrage of sixteenth notes carved out of two hexagonal scales built largely on the minor 2nds and 3rds, was used instead of the slower and more traditional dinaladay. Providing a contrast is the languid, soothing andante cantabile that breaks away from the propulsive binalig rhythm and incorporates a freer diatonicism in its harmonic texture. Overall, the piece's rhythmic vitality is fed by abundant syncopations, cascading patterns, short repetitive pulses, and vigorous interplay between melodic runs and choral strokes. This work was commissioned by the Philippine Association for Graduate Education and Mr. Angelito Agcaoili. Inspired by the indigenous music from the Northern and Southern part of the Philippines, Prelude Etnika and Toccata are the only guitar compositions of National Artist for Music Lucresia Kasilag. Music from the Cordillera region was the inspiration for Prelude Etnika. It is based on the ethnic song Dong Dong Ay. Kasilag used elements such as the pentatonic scales, drones, and ostinatos to capture the essence of the Cordillera music. The Toccata, on the other hand, was inspired by the music of the kulintang. Prelude Etnika and Toccata were both written in 1996, as requested by Filipino guitarist Phil Valdez. Kanayonan (In the Barrio) Kanayonan comes from the word Nayon, a synonym for the Barrio, meaning town, in Pilipino. Kanayonan itself denotes “in the barrio.” The reason for the use of the Bahay Kubo song is that the bahay kubo (nipa hut) is the most common dwelling place or home of rural village folk. Citing Bahay Kubo as a popular theme of folkloric music, the nine variations vividly reflect various common town scenes or happenings when walking along the Nayon. Labanedera sa Batis reflects the joy of women doing their laundry while socializing by the riverside. Pistahan highlights the happy celebration of the annual tribute, the fiesta, to the town’s patron saint. This is probably the grandest festivity in Philippine communities. Lako lako are vendors carrying products in a big bilao on top of their heads while shouting “Bili na kayo” (Please buy now). Idakan means dancing, which is also a common feature in all kinds of events. Simboryo is the archaic term for “Chapel.” The music suddenly becomes slow and solemn, and no longer lively and festive. This reflects the blessing of the living and the dead. Tago-an and Pitik Bulag are among the most loved children’s games that are played outdoors. Palaro sa Kalabaw is a race among carabaos, or water buffalos, while they are dressed, decorated, and crowned with fresh flowers on their necks and bangles on their shins. Aside from racing, they also parade around the town. Biyaya ng Langit reflects the harvest crops, which are the townspeople’s bounty and God-given grace. This to them is a blessing from above for they are provided with food for the rest of the year. The Finale ends the piece in a grand manner. This is a recalling of all the events in the town and the variations in this piece. It vividly reflects the energy and undaunted spirit of the hardworking Filipino farmer who tills the soil. Maestro Jose Valdez is already an institution in the world of the classical guitar. He is the most illustrious guitar maestro and one of the most respectable figures in Philippine Guitar history. As a professional, he has taught and performed for a span of more than 30 years, starting as a child prodigy at the age of 14. It was in this capacity that his name has become a byword among guitar aficionados. A bright little star is seen in the heavens, hovering somewhere near perfection. continuous glaring, sometimes gliding, but what it does is tender guiding. Mysterious little star, what could it really be? Alas! Her name is Zsa Zsa, and she's mine and mine alone - Greg Yu. This piece was written for Greg Yu's wife, Zsa Zsa. Ernani J. Cuenco is a seasoned musician born on May 10, 1936, in Malolos, Bulacan. A composer, film scorer, musical director and music teacher, he wrote an outstanding and memorable body of work that resonates with the Filipino sense of musicality and which embody an ingenious voice that raises the aesthetic dimensions of contemporary Filipino music. Cuenco played with the Filipino Youth Symphony Orchestra and the Manila Symphony Orchestra from 1960 to 1968, and the Manila Chamber Soloists from 1966 to 1970. He completed a music degree in piano and cello from the University of Santo Tomas where he also taught for decades until his death in 1988. The later works of Cuenco have enriched the Filipino love ballad by adding the elements of Kundiman to it. Nahan is a song about longing for the love that has faded. Lyrics of the song were written by National Artist for Literature, Levi Celerio. 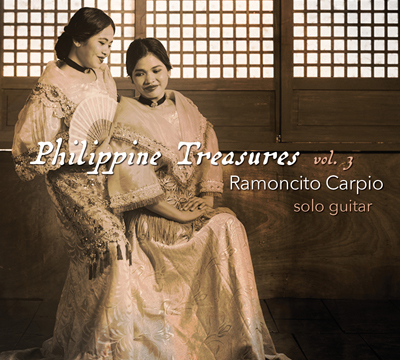 Filipino guitarist Ramoncito “Monching” Carpio is recognized as one of the leading classical guitarists and pedagogue in the Philippines today. He is actively promoting the art of the classical guitar not only by performing and teaching but also through organizing guitar concerts, festivals, and competitions. Monching earned his Bachelor of Music, major in guitar at the UP College of Music under the tutelage of Prof. Lester Demetillo. He completed his Master of Music degree at the Philippine Women’s University (PWU) School of Music under the guidance of Prof. Benchito Cariño and thereafter continued to pursue doctoral studies in music with Dr. Angelito Agcaoili. He has taken master classes with world-renowned guitarists such as Jorge Luis Zamora (Cuba), Aniello Desiderio (Italy), Berta Rojas (Paraguay), Judicael Perroy (France), Roman Viazovsky (Ukraine) and Shin-Ichi Fukuda (Japan). In addition, he has also taken special lessons with then Philippine–based German guitarist Carsten Linck. In 2012, he won the 1st prize at the Asia International Guitar Competition in Thailand and 2nd Prize at the Taiwan International Guitar Competition. His other awards include 1st Prize at the Philippine International Guitar Competition (2011), 3rd Prize at the Singapore International Guitar Competition (2011), 3rd Prize Bangkok International Guitar Competition (2010) and 2nd Prize at the NAMCYA Guitar Category C held at the Cultural Center of the Philippines (2009). Monching has performed in numerous concerts around the Philippines and in several guitar festivals abroad and had been invited as part of the jury in international competitions. He was a featured soloist with the Manila Symphony Orchestra (MSO), performing Rodrigo’s Concerto de Aranjuez, under the baton of Arturo Molina. In 2013, he released his first solo album entitled “Pahinungod". Alongside other guitar faculty members of the country’s most respected music schools and conservatories, Monching formed the Manila Guitar Quartet. The group aims to encourage unity and camaraderie among guitar schools, institutions, and local guitar societies. Aside from performing and teaching, Monching also writes and arranges music for solo guitar, guitar ensembles, and stage plays. Monching currently teaches at St.Scholastica’s College and Santa Isabel College in Manila. He is also the director of the Manila GuitarFest, PWU Classical Guitar Competition, and St.Scholastica's College Classical Guitar Competition.